One thing that amazes me about my MySpace profile is how ugly it looks. But hey, a site with 50 million registered users must be doing something right… Now, do you hate your current MySpace layout? Is your MySpace background all cluttered and overly loud with horrible colors in it? 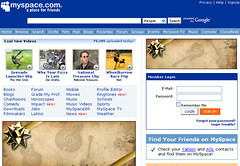 At AskStudent, we scouted the web and made a list of Top 10 MySpace Layouts which do not look like MySpace at all. They are minimalist but at the same time highly functional and above all they are not ugly. Some themes listed below can be downloaded and others can’t. 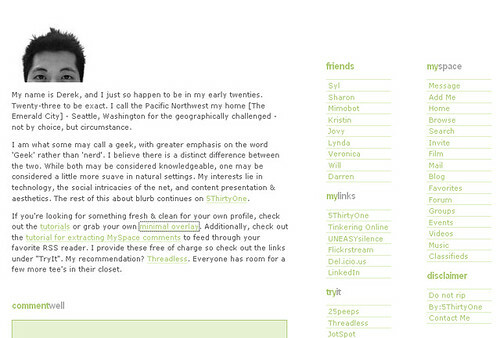 When we ranked the MySpace layouts, we definitely looked at the aesthetic value as well as functionality. Also, some theme’s didn’t have any names. In these cases, we made the names up. 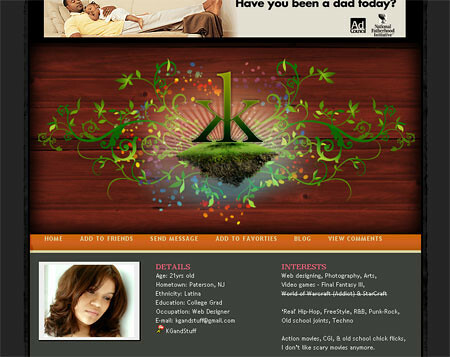 Also, if you download some of these themes, they may be violating MySpace TOS. Make sure you keep that in mind. This MySpace theme was created by Ben Bishop. The layout is very functional. 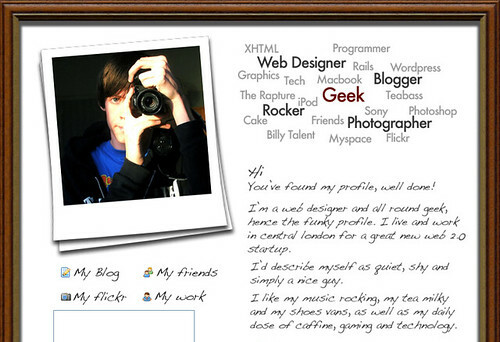 Ben is a professional web designer and his MySpace theme reflects on his trade very well. This layout is very well done. 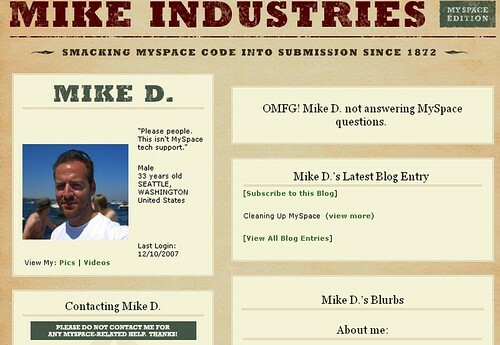 However, the author KGandstuff is currently refusing to share the code for her MySpace theme preserving its uniqueness. 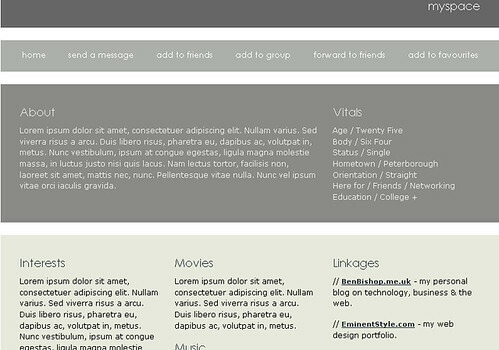 However, for all the CSS n00bs out there, it is a very good design to learn and learn from. 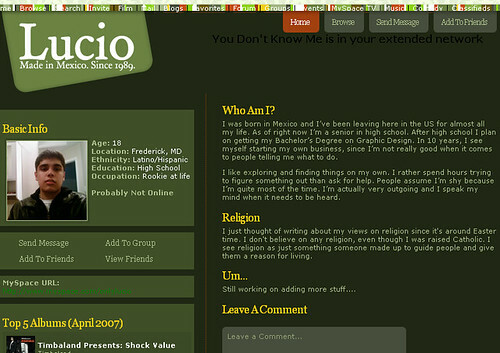 This profile is excellent for those who have a large number of pictures as shown by the author of this MySpace theme … a photographer by profession. This is simply awesome. Make your MySpace profile look like the other #1 Social networking site… Facebook. Lots of people like Facebook because of its cleaner layout. However, you can’t get away from MySpace. Enter Justin Adlock’s Facebook layout for MySpace. It resembles the look of Facebook but you retain almost all the functionality of your MySpace account. On the right hand side, just like Facebook, you have your personal information and below it, your Wall. On the left sidebar, you have your Top friends list, Photos, website and other options you can customize. 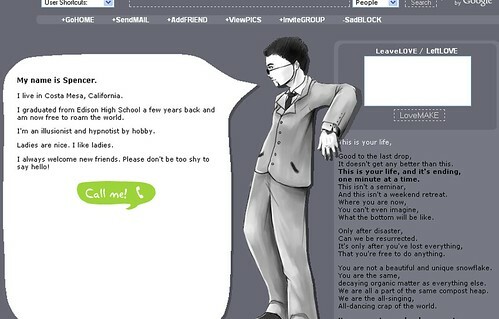 This excellent MySpace theme is the brainchild of Eston Bond. Besides having a cool last name, he has an extremely cool MySpace page. 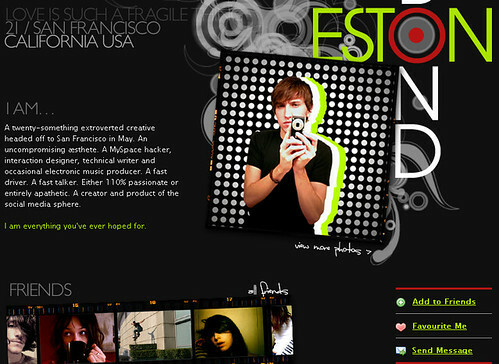 Since he is a web designer, Eston is kind enough to share his expertise on how he created this excellent MySpace layout here. Posted in Creativity and tagged myspace, myspace layouts, myspace themes. Bookmark the permalink.